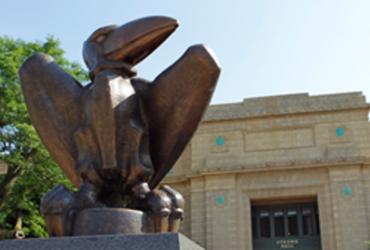 MANHATTAN, Kan. – Led by an all-around effort, including 367 yards of total offense and a defensive effort that held Texas Tech out of the end zone, Kansas State wrapped up its home schedule with a 21-6 win in front of 47,287 fans on Senior Day at Bill Snyder Family Stadium on Saturday. K-State (5-6, 3-5 Big 12) earned its seventh victory in the last eight games against Texas Tech, including the fourth-straight victory over the Red Raiders in Manhattan. The win also gave the Wildcats their fifth-straight victory on Senior Day and the 22nd in head coach Bill Snyder’s 27 seasons. The all-around effort was headed by the K-State defense that held Texas Tech out of the end zone for the entirety of the game, while also holding them to 181 total yards, the least surrendered by the Wildcats since a 117-yard output in 1997. The 181 yards is also the fewest gained by Texas Tech since being held to 144 against Texas in 2010. Saturday marked Senior Day for the Wildcats, as the program paid tribute to 16 players who have been such an integral part of the program over the last four seasons. The 16 seniors include, Kendall Adams, Abdul Beecham, Jeremy Collier, Dalton Harman, Matt Jones, Osvelt Joseph, Colby Moore, Zach Reuter, Dalton Risner, Duke Shelley, Justin Silmon, Sam Sizelove, Logan Stoddard, David Tullis, Eli Walker and Dalvin Warmack. On the first two offensive drives of the game, Texas Tech benefited from its special teams play, as senior place kicker Clayton Hatfield connected on a pair of field goals, including a 42-yard field goal with 1:26 left in the first quarter. After the consecutive Red Raider field goals, the Wildcats gained a spark on their next defensive possession, as redshirt freshman defensive end Wyatt Hubert burst through the line to record a 9-yard sack on the first play of the second quarter. After forcing the Red Raiders into a punt, the Wildcats moved down the field for a score of their own, as the team totaled 51-yards on eight plays, capped off by a 20-yard field goal from sophomore place kicker Blake Lynch to close the gap to 6-3 with 10:33 left in the quarter. Later in the second quarter, Texas Tech went for it on fourth and four, and were shut down after fumbling the snap, resulting in another sack by Hubert. 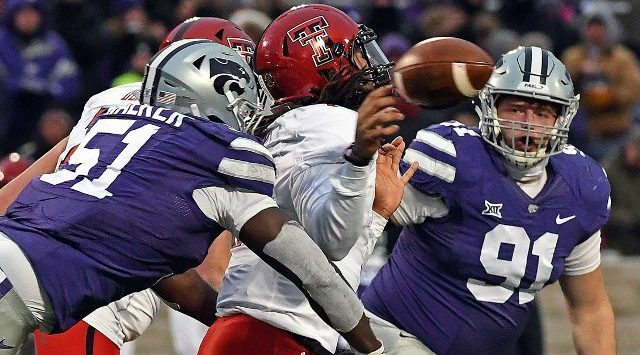 The sack gave K-State the football into Texas Tech territory at the 48-yard line. The offense made good use of the short field position, as the Wildcats drove into scoring position, leading to an 8-yard touchdown pass from sophomore quarterback Skylar Thompson to freshman wide receiver Malik Knowles to give K-State the lead, 10-6 with 43 seconds left before halftime. The Wildcats would hold the lead at the half after totaling 127 yards of offense, while posting three sacks on defense. In the third quarter, it was the K-State special teams that made the first impact, as sophomore defensive back Brock Monty blocked the Texas Tech punt, deflecting the ball through the end zone, resulting in a safety. The safety marked the first since 2009 against Louisiana, as the Wildcats led 12-6 with 9:13 left in the third quarter. On the ensuing defensive possession, junior defensive end Reggie Walker forced a strip sack, which was recovered by junior linebacker Justin Hughes at the Texas Tech 22-yard line. The turnover led to a 34-yard field goal by Lynch, to give K-State a 15-6 lead with 3:27 left in the third quarter. Just before the end of the third quarter with Texas Tech in the red zone, sophomore cornerback AJ Parker intercepted Jett Duffey at the 7-yard line, giving K-State its first turnover of the game. After the turnover, the Wildcats drove down the field for an 11-play, 69-yard drive that led to a 41-yard field goal from Lynch, which improved his day to 3-for-3, as K-State led, 18-6 with 10:23 left in the game. Late in the fourth quarter, junior defensive end Chase Johnston recovered a Texas Tech fumble deep into Red Raider territory, giving K-State the football in scoring position. The turnover led to another field goal by Lynch, this time from 22 yards, as the Wildcats increased their lead to 21-6 with 3:39 left. On the subsequent drive, K-State forced another 3-and-out and took over on the Texas Tech 13, running out the rest of the 2:38 on the game clock. Skylar Thompson – Sophomore quarterback Skylar Thompson set a series of career highs on Saturday, throwing for a career-high 17 completions and career-high 213 passing yards. Thompson connected on 17-of-26 passing for 213 yards and a touchdown, leading to a passing rating of 139.2. Malik Knowles – As a true freshman, wide receiver Malik Knowles hauled in five receptions for 56 yards and a touchdown, leading the Wildcats in receiving on Saturday. Knowles’ touchdown on Saturday also marked the second of his season, the most by a K-State true freshman since Tyler Lockett in 2011. Wyatt Hubert – The redshirt freshman defensive end accounted for two of the team’s four sacks on Saturday, upping his season total to 4.5 sacks and moving him into tied-for-third in K-State history for most sacks in a season for a freshman. Hubert’s 4.5 sacks ties Elijah Lee’s 4.5 sacks set in 2014. AJ Parker – With K-State leading by 9 in the third quarter and Texas Tech threatening, sophomore cornerback AJ Parker jumped a pass by Texas Tech’s Jett Duffey in the red zone, forcing the first K-State turnover of the game. The interception marked the second of the season after intercepting West Virginia earlier this year. Reggie Walker – The junior defensive end was a force in the backfield on Saturday, recording a career-high three tackles for loss, two of which were sacks. Walker also registered six tackles in the game and two forced fumbles. Brock Monty – The Wildcats found a special teams’ score in the third quarter when sophomore defensive back Brock Monty blew up the Texas Tech punt, blocking the punt and sending it through the end zone for a safety. Monty’s blocked punt marked his second of the season and first blocked punt for a safety since 2003. 181 – The Wildcat defense stepped up to hold Texas Tech to 181 total yards on Saturday, the fewest the Red Raiders have gained since 2010, when they when they were held to 144 yards. The 181 yards were also the least surrendered by the Wildcats to the Red Raiders since a 117-yard output in 1997.